Co-directed with no slight imagination and great sleight of hand by Adam Posner and the magician Teller (he of Penn and Teller fame), CST’s season opener is pure enchantment – as credibly human and affecting as it is vibrant, fanciful and fresh. But not least, this “Tempest” sails on the zephyrs of Shakespeare’s language. It is beautifully, thoughtfully and expressively spoken, a poetic gem that never loses its clarity even amid the tumble of crazy comedy and jaw-dropping magic tricks. This is eloquent story-telling, a mystical romance made more wonderful by some prestidigitation that might not be found even in Prospero’s books. And in Larry Yando, CST has a marvelous Prospero, the deposed duke – and practitioner of magical arts — who for 12 years has raised his daughter Miranda on a remote island. The only other inhabitants are Prospero’s two slaves, the bestial Caliban and the fleet spirit Ariel. When a ship bearing Prospero’s old malefactors – his own brother Antonio, the King of Naples Alonso and the king’s brother Sebastian – comes within range of his powers, the vengeful magician summons a storm that tosses them all onto his shore. Also among the soaked, albeit unharmed, contingent, but separated from them and presumed drowned, is the king’s son Ferdinand, the destined heart’s delight of Miranda. When push comes to shove, and with a humanistic nudge from insubstantial Ariel, Prospero sets bitterness aside to embrace his old enemies and the better prospects that life now holds for all. Yando taps deeply into Prospero’s ambivalence as the wronged duke. Now master magician, he cautiously nurtures the blooming love between Miranda (the exuberant, wide-eyed Eva Louise Balistrieri) and Ferdinand (the endearingly bedazzled Luigi Sottile). Even as his better instincts lead him toward loving kindness, the old wounds remind him of his abuse. It’s a joy to hear Yando imbue Shakespeare’s charged and nuanced words as if new-minted from Prospero’s own spontaneous thoughts. The actor’s delivery is patient, precise, resonant. Even in the epilogue, Prospero’s appeal to the audience to release him with an approving hand, bears specific weight and point and charm – rather like a brilliant encore after a splendid concert performance. Hardly less bewitching is Nate Dendy’s crisp, agile turn as Ariel. Tall and lean, done up in whitened face and plaid britches, Dendy’s clever wraith proves also to be a quick hand with a deck of cards. 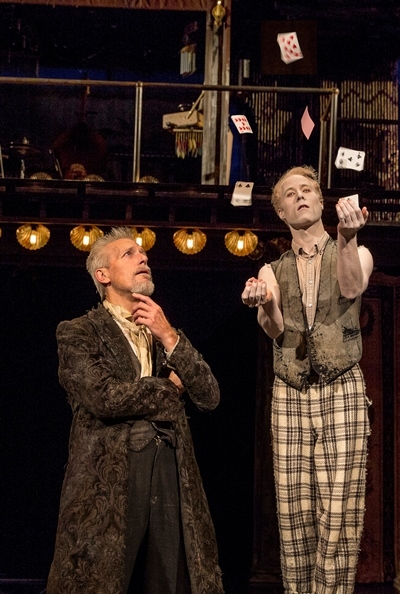 His card tricks pepper the play, though in an intrinsic way that lends the whole evening an aura of playfulness. 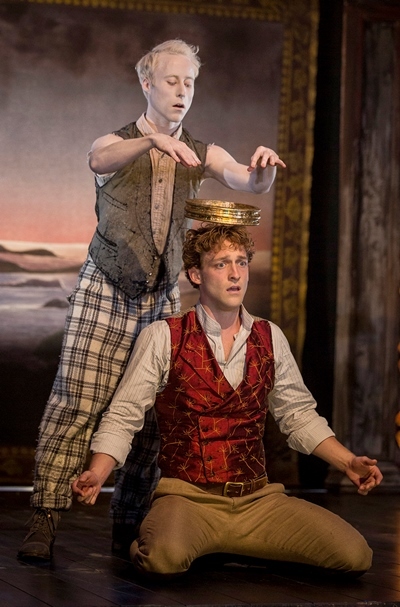 Yet the most remarkable inhabitant of this wondrous isle is surely Caliban, in the entangled acrobatic forms of Zach Eisenstat and Manelich Minniefee. 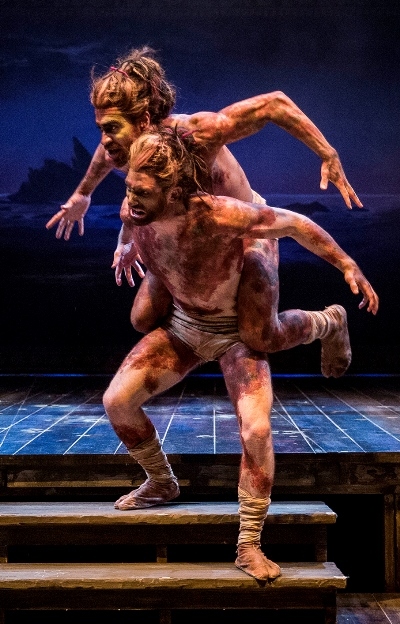 The unified creation of famed Pilobolus choreographer Matt Kent, these variously interlaced and dapple-painted actors roll, tumble, hop or bound about the stage as one. They also chorus Caliban’s lines together. Caliban can be a pretty repugnant character; these guys are a riot. Among Prospero’s forcibly invited guests, the comical pair of Adam Wesley Brown’s Trinculo and Ron E. Rains’ Stephano, a couple of court musicians, are two cool and very funny dudes – sort of Elizabethan Blues Brothers. The big picture of this “Tempest,” the set designed by Daniel Conway, is spectacular in a kind of carnival midway fashion. Lights strung high over stage and audience place everyone within a big-top frame. Upstage, a side show space with a covering flap periodically reveals all sorts of marvels that seem to materialize from thin air – or defy the conventions of gravity. 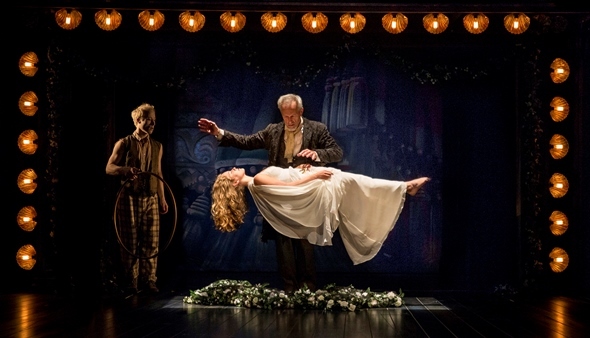 Prospero even puts the newly betrothed Miranda through a lighter-than-air metamorphosis, as if from girlhood to woman’s estate. Above this magical alcove, a four-piece band and two vocalists punctuate the doings with a fetching blues-rock score by composer Tom Waits and collaborator Kathleen Brennan. Shakespeare, who expected music in his plays, surely would have loved this.